To be released 30 July 2003. Features JLA/AVENGERS Diary by George Pérez. JLA/Avengers artist George Pérez's cover for Avengers #184 catches the true essence of Absorbing Man: he's tough as all hell to put down! This 1979 cover depicts Creel's towering presence, unaffected by the assailing Avengers. The story has Creel escaping America to earn his freedom - even though he insist on always wearing presion pants and toting a ball and chain. NM Value: $7. I received the new Wizard in the mail just before going to work. It only shows two new JLA/Avengers panels if I remember right. One where you see the inside of Jo'nn Jon'zz mind. He's thinking of past JLA members, so you see head drawings of them in his mind. Then the other panel I think only shows half of the page. a split face with Bats on one side and Cap on the other. At the bottom Batman and Cap are about to fight. Next to the split faces are on one side Thor and Wonder Woman. On the other side Plastic Man, Iron Man, Quick Silver and Scarlet Witch. The rest of the page isn't shown. George says Thor draws first blood. He also says he almost resigned from doing this series believe it or not. Anyway I know you'll read it tomorrow. By the way, George is listed as appearing at Wizard World Texas in November. Cool huh? Then of course there's Wizard. DC's relationship with Wizard seems to have been turned up a notch of two, with news stories being given exclusively to the magazine - something that hadn't been the case for the last few years. Which means they're often in the situation where policy has been decided but can't be released, as Wizard has a six week lead time to publication - the magazine has to be finished six weeks before it's on the comic book racks. So DC have to deny/prevaricate when it comes to comment on a story. This has been usual practice for Marvel of late, it's just harder for them to keep things under wraps. The amusing situation gets quite farcical when the subscription copies of Wizard arrive a week earlier than the comic shop copies. Suddenly all the newshounds have copies of the stories, printed, but the companies still can't comment because the magazine hasn't been distributed to comic stores yet. 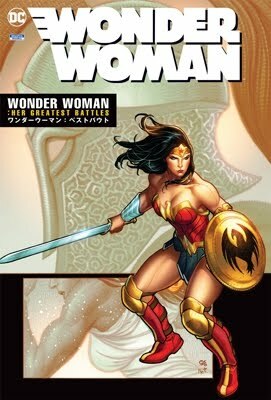 This week's announcement of Jim Lee and Brian Azzarello on Superman on WizardUniverse.com was precipitated not only by the weekend's rumours, but also that subscription copies of Wizard Zero hit the doormats, featuring the story. This is also where Newsarama's mention that Greg Rucka and Chuck Austen being confirmed on monthly Superman titles came from. Of course they can't say where they came from, otherwise it would be admitting they're just reading from a magazine. Behold the future! 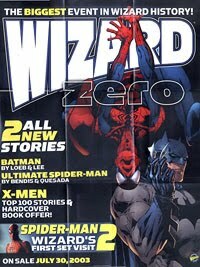 Wizard Zero redefines the look, style, and feel of Wizard: the Comics Magazine with unprecedented new features. Wizard Zero will be totally redesigned from previous issues and feature a JLA/Avengers diary by George Perez, news on the new Superman movie, the Best Artists in Comics - Alex Ross, Brian Bolland, Bryan Hitch - and more! Wizard Zero also features a bigger, all-new comic book price guide with over 40 pages of prices and market trends! Whatever you do, do NOT miss this landmark Wizard event! “Wizard” is redefining itself, beginning with its upcoming #0 issue. This will include original Spider-Man and Batman comic stories, interviews, new features, and other stuff that makes “Wizard”, “totally redesigned from previous issues”. Also included are the Top 100 X-men comics of all time, and an expanded price guide. Wow, they reverted back to their old selves in no time at all! Literally. In 1991, Wizard: The Comics Magazine forever changed the way comics fans looked at their favorite titles, characters, and creators. This summer, Wizard Entertainment will change the way readers look at the monthly itself with the release of Wizard Zerø. During its lifetime, Wizard has continuously redesigned and refined its many features to be more informative, more exciting, and more entertaining. This bold, new phase of the magazine's evolution should entice both faithful and new readers to sample Wizard's magic. Wizard Zerø will kick off in style with two never-before-seen, six-page comics stories: a Batman tale by Jeph Loeb & Jim Lee (set between Batman #615-#616 in their "Hush" storyline); and an Ultimate Spider-Man story written by Brian Michael Bendis and illustrated by Marvel Editor-in-Chief Joe Quesada (marking his first story since 2002's Marvel Knights Double Shot). Other features scheduled for Wizard Zerø include an on-set visit to the set of the sequel to Sony Pictures' Spider-Man; a Wizard Zerø Artist Profile on Neal Adams (with exclusive art created for the issue); George Perez's JLA/Avengers diary; "Basic Training" with Fathom creator Michael Turner; an expansive comic book price guide (with a Special Report on the Top 100 X-Men Books of All Time); and more. The issue is offered with two covers -- a Lee/Quesada Batman/Spider-Man Cover (JUN031931, $4.99), and an alternate cover featuring Spider-Man 2 Concept Art (JUN031932, $4.99) from the upcoming film -- and is scheduled to ship on July 30. Going back to grass roots editorial features, Wizard Entertainment has created a new publication that’s not only a throwback, but a hybrid. Because this "old school" magazine also features exclusive comics stories from top creators in the industry. It’s an entirely new kind of equation. And they simply call it Wizard ZERØ. Different? Yes! That’s entirely the point. Not only will you get extensive coverage of newsworthy events in the comics community—like the filming of the new Spider-man movie—but also familiar features like in-depth artist profiles. And it gets better. How about a JLA/Avengers diary by George Pérez? Or maybe news on the new Superman movie? The return of "Basic Training?" All of this and more make up Wizard ZERØ. The "more" part specifically referring to the exclusive comics that you’ll see from Jeph Loeb and artist Jim Lee — they contribute an all-new 6-page Batman story that takes place between issues #615 & #616 — and Brian Michael Bendis joins Editor-In Chief Joe Quesada for a 6-page Ultimate Spider-Man tale. Yes, Wizard ZERØ ups the ante for news and fun with comics entertainment. Look for it in the Premiere section of Previews! ...Wizard ZERØ will be totally redesigned from previous issues and feature the following: A JLA/Avengers diary by George Pérez.